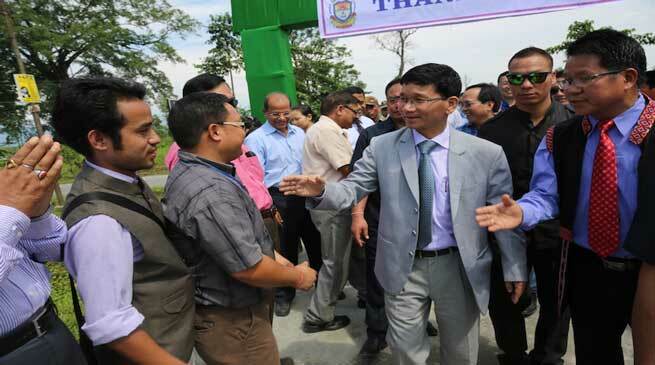 Chief Minister Kalikho Pul on Friday made an unannounced visit to the Indira Gandhi Government College, Tezu and inspected the overall collage. His visit was followed by the inauguration ceremony of a new college library building, which was inaugurated by Aalo MLA Jarkar Gamlin, where the Chief minister also present. Nampong MLA Laisam Simai, who accompanied the Chief Minister’s entourage team to Tezu, led the ribbon cutting ceremony. During the visit, the Chief Minister inspected the library facilities, enquired the teaching staff on the availability of newspapers and books, inspected the toilet facilities in the library room. He also visited the girls hostel, kitchen, store and toilet facilities. He was informed that there was shortage of science books in the college library, to which the CM asked the authority to prepare a proposal and submit accordingly. The faculty informed the CM that the college faced great water shortages. Finding the kitchen in dilapidated conditions with stagnant water all around the building, the Chief Minister directed the district administration to immediately prepare a proposal. The CM selected the site for new kitchen and dining room on spot. He instructed to make RCC table and bench and provision for serving food from the kitchen. On complaints of repeated power failure, the Chief Minister assured to provide a DG set as backup. He also asked the administration to prepare proposal for boundary walls and gates to prevent stray animals from entering the hostel compound. check on such shortcomings. Further, the Chief Minister visited the boys hostel. He first inspected the kitchen facilities and appreciated the cleanliness maintained. On shortage of helpers and cook, the CM directed the administration to immediately fulfill the requirement. He also directed the deputy commissioner Danish Ashraf to visit the college hostels along with officials from PHE, PWD and electrical department to address the shortages of infrastructures, water and electricity. Further, the Chief Minister asked the administration to conduct regular social service every Saturday for college, market and hospital. The CM inspected the toilet facilities, and asked the administration for its renovation. He also asked the college principal for early submission of its inventory report and the status of the facilities in the college.